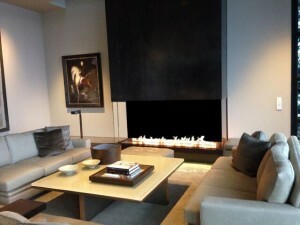 One of the primary appeals of a wood burning fireplace is the ambiance the sounds create. The pop and crackle of wood appeals to our senses in a primal way, and there just isn’t anything that can quite compare. While all wood types will pop and crackle, if you are after a symphony of natural burning sounds, then a softwood could be the way to go. Softwood dries quickly and will typically produce larger flames and more crackling fires. Keep in mind that softwood isn’t the most efficient for producing maximum heat and the fires don’t last quite as long. Also, since the pops and crackles can typically throw sparks, make sure your fireplace either has a screen or ceramic glass door for safety. While softwood isn’t always recommended for fireplace efficiency, if you want a loud fire, it’s the way to go in many cases. While fires are pretty to look at, they also serve as interactive ways to cook. If you decide that you want to grill over your fire or use a cooking arm to warm up a pot of soup or tea, you should look for a super-hot, long-burning fire. To get this type of fire, hardwoods are recommended because they tend to produce the most amount of coals—perfect if you’re planning on using a Dutch oven or similar cooking method. Let the fire burn down and the flames subside a bit, and then you’re ready to get cooking.